The Best Canon Camera For Sports Photography On The Market! These days, watching sporting events in the comfort of your living room is like watching the games from a choice seat. Technology has advanced by leap and bounds to enhance sports coverage and gain wide viewership. Networks are making use of specialized cameras to record every bit of the action. Cutting-edge stump cameras or those with hawk-eye tech applications are some of the recent innovations that make for exciting viewing. In this article, we will be taking a look at the best canon camera for sports. If you are a sports buff, you can be part of the action and take pics of your favorite athletes and their sleek moves. There are countless cameras advertised as the best for live action shots. However, only one brand of camera has a wide range of cameras for almost all types of photography needs including sports. Canon, to this day, holds that distinction. Lets get things started in our search for the best canon camera for sports. Any coach would prefer to draft a player with the makings of an MVP. In camera parlance, the first-round draft pick is none other than the EOS-1D X Mark II. The stat sheet is long and formidable. It features a 20.2MP full-frame CMOS sensor, Dual DIGIC 6+ processors, and a 61-Point High Density Reticular Auto Focus II with 41 cross-type points and a center point sensitive to -3 EV. The uniform is made of durable magnesium-alloy body that has been designed for the active pro shooter. The speed is uncanny. It runs 16 frames 16 frames per second in live view plays and 14 fps when play is set for the viewfinder. The EOS-1D X Mark II has the capability to record up to 170 raw files in a single burst when the CFast 2.0 memory card is in use. This MVP supports DCI 4K-resolution video recording at up to 60 fps, along with Full HD 1080p shooting at 120 fps for slow-motion playback. Expect nothing less than an all-star performance. The best Canon camera for sports is exactly what the photographers ordered to go for the gold in a major sporting event or just some tune-up shooting sprees in the nearby neighborhood park. The 20.2MP full-frame CMOS sensor and Dual DIGIC 6+ Image processors guarantee quality and accuracy. Moving onto our second choice for the best canon camera for sports. The EOS 7D Mark II deserves the no. 2 spot in the starting five of the DSLR team. Its speed of 10 fps is adequate to qualify as the worthy contender to the best. Canon’s most advanced camera with an APS-C sensor hits 10 fps–add that to a 65-point autofocus system and it’s may even induce a little drool in sports photographers. While the speed is a clear selling point, the Canon EOS 7D Mark II looks to be well-rounded as a whole. Sports shooters will drool at the features such as Intelligent Tracking and Recognition (iTR) for improved focus tracking, The Dual-Pixel autofocus feature is perfect for smooth, natural looking emphasis when shooting videos. The 7D EOS Mark II is not a full frame cam but it is as versatile as the best Canon camera for sports. Moving on to our third choice for the best canon camera for sports. 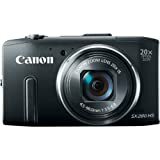 The pocketable compact PowerShot SX280 HS is a 20x superzoom with a 12MP CMOS sensor, 25-500mm equivalent image-stabilized lens and a 3 inch 460k dot screen. It offers built in Wi-Fi connectivity and GPS. It can’t be overlooked as a valuable asset in a team of superstars. This polycarbonate bodied player can deliver some sleek moves when called into action. The PowerShot SX280 HS is one of the best compact superzooms photographers on the planet have ever seen. it packs a horde of features including Wi-Fi, GPS, and 1080p60 video capture among others. The 20x zoom lens is surprisingly sharp and the speed is a prominent trait of this compacted gear. You will be amazed at the video mode which is a real show-stopper. You can switch between 30 or 60fps frame rates that renders the highest picture quality never seen in a small-sized shooter. Even the details are unusually sharp and precise. It’s not the perfect camera but not a run-of-the-mill either. Canon intended this pocket ultra-zoom camera to be a dependable travel shooting companion. You wouldn’t be disappointed as the GPS and Wi-Fi are fantastic inclusions. You know exactly where you are when you take pictures, upload in your smartphone and immediately post in social media for your friends and fans to see. As a photographer, the SX280 HS should be one of the needful cameras in your list. The EOS Rebel T6 is also supplied with a 3-inch, 920,000-dot LCD and an optical viewfinder. The T6 features a host of scene modes, such as the Scene Intelligent Auto mode plus several creative filters. Full HD can be captured at 30p or 24p. The Rebel T6 also boasts of a Wi-Fi with NFC for easy sharing via Canon’s Camera Connect application. Moving on to our final product for the best canon camera for sports. The EOS-1D X DSLR Camera is designed with the pro shooter. It can withstand the demands of daily grind with its tough magnesium alloy body, large 3.2″ LCD and clever too with the Intelligent Viewfinder. A saline feature is the 18.1MP CMOS sensor. This cam can assume a starting role If you are looking for a tough honcho that can shoot action scenes. The large pixel size delivers outstanding still images and 1920 x 1080 video. Canon did pretty well with the smart layout of the controls. You won’t any action because of the Dual CF while the Gigabit Ethernet terminal and the WFT-E6A Wireless File Transmitter. Awesome file sharing on the fly with its efficient GPS connection. This rig is made of magnesium alloy and the body is dust and weather resistant. Highly noticeable is the shutter durability of up to 14 fps for up to 400,000 cycles – allowing you to do your thing and just click away. Sports cameras need to have certain characteristics to capture exciting action and game winning moves. The sporting event may be indoor or outdoor but photographers need the perfect gear to function exceptionally well in both settings to get that shooting advantage. To keep up pace with the minute-by-minute action, look for a camera with remarkable speed, a fast bursting speed. A camera with a speed of 5 frames per second is decent but the one that runs at 10 frames per second is exceedingly adept to meet the sporting challenge. Do not scrimp on memory cards as the cheap ones are disappointing. They can in fact slow your camera’s performance. Zooming is important for sports photography. You need a camera with exceptional zooming qualities whether you are seated on a ringside seat or in the middle of the bleacher section. Action takes place in just about any distance from where you are. Superzoom cameras work great shooting your favorite athletes and your kids running their track and field race. However, if you have enough spare in your wallet, choose a DLSR with a 70-300mm lens for that sporting advantage. Sporting events are held inside arenas, out in the field or a combination of both like in tennis matches or the Superbowl. Action scenes happen under the glare of powerful LED lights or the piercing sunlight. The ideal sports camera should be equipped with the appropriate lens to overcome any light conditions that would affect the quality of the pictures. Here is our conclusion for our buyers guide for the best canon camera for sports. Among the types of photography, the skill in sports photography is something you learn on the court. When the buzzer sounds to start the game, you can’t always anticipate any plays. It’s important that for you to be constantly watching for it and ready to welcome the unexpected. The best Canon camera for sports and the other members of Canon’s illustrious team have all the qualities that make for truly great sports photographs. You can capture the emotion, skills, and the highlight moves of your favorite athletes including your kids. The challenge that faces photographers doing sports photography can be overcome by teamwork and chemistry with a good camera gear. 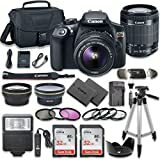 These Canon cameras and its lenses, if complemented with the right techniques, perfect timing and angles will definitely bring the desired results. Just like the outstanding athletes, sports photographers require practice, training and discipline to bring them to A-1 status. But more than the yearning to capture the best sporting action, you should be enjoying while shooting them. Do not snuff the fun out of this entertaining activity. Over time you can be adept like the pros. Watch as they take the shots and enjoy the games simultaneously. The Five Best Canon Cameras For Portrait Photography!